In an age when it seems like everything is getting smaller, there’s nothing quite as refreshing as a spacious full-size sedan. When you’re looking for copious passenger space, plenty of room in back, lots of power, and today’s latest features to boot, the 2016 Chevrolet Impala has it all. Of course, it’s not the only model available in this segment, and the 2016 Ford Taurus remains a top rival of the Impala. A bit of research goes to show how many ways the 2016 Chevrolet Impala beats the Ford’s full-size model. It takes quite a bit of power to propel a full-size sedan, especially if you want it to feel like it responds to your acceleration demands. In this area, the 2016 Chevrolet Impala beats out the 2016 Ford Taurus. Impala buyers have a couple of different engine options to choose from, including a 3.6L V6 that pumps out a robust 305 hp and 264 lb-ft of torque. There are two engines available on the Ford Taurus, including s a 3.5L V6 that makes a lesser 288 hp and 254 lb-ft of torque and a turbocharged 2.0L four-cylinder that produces just 240 hp and a slightly higher 270 lb-ft of torque. More drivers today are looking to save money at the pump. If that’s your priority, the 2016 Chevrolet Impala again proves the better choice. When equipped with the base 2.5L inline-four engine, the Impala gets an impressive EPA-estimated 31 mpg highway and 22 mpg city, excellent numbers for a full-size sedan. Meanwhile, the 2016 Ford Taurus achieves just 27 mpg highway and 18 mpg city, which means quite a bit more money spent on gas. It’s not surprising that both of these models come quite well equipped, with standard fare on both vehicles including Bluetooth, full power accessories, and remote keyless entry. However, several exciting features don’t come standard on the 2016 Ford Taurus base trim but are offered as base features on all 2016 Chevrolet Impala models. Perhaps the most important of these is Chevrolet’s exclusive OnStar telematics system, which comes with emergency roadside assistance, automatic crash notification, and a 4G LTE Wi-Fi hotspot that allows Internet connection for up to seven mobile devices at once. Even if you opt to pay more to get a telematics system on the Ford Taurus, it won’t come with a 4G LTE Wi-Fi hotspot. 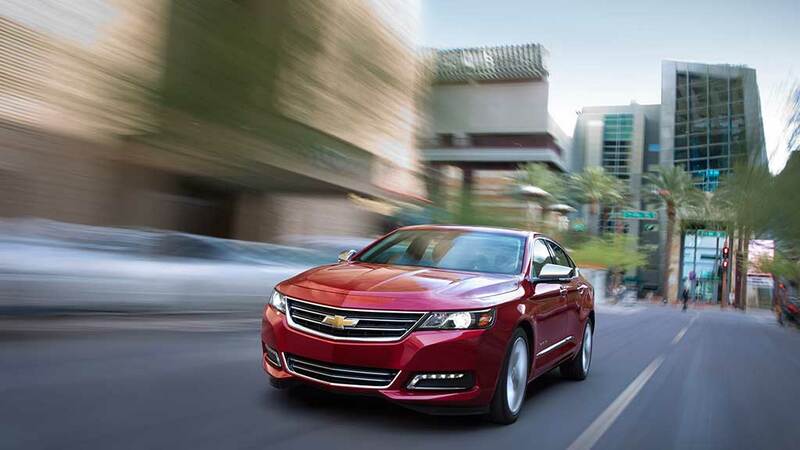 The team at Sunrise Chevrolet wants to help you find the right 2016 Chevrolet Impala model for your budget and needs. Pick the color and trim of your choice at our dealership, located at 414 E. North Ave. in Glendale Heights, IL, and give us a call at (630) 487-3741 with any questions.